Takes place on Saturday 7th January at 11.45am in the Lakeland Forum. This is open to all girls with 2003 date of birth. This will be an outdoor session, please come prepared for all elements!! All girls to bring water bottle & gum shield! Contact Michelle 07843378227 if further info required. All players to wear gumshields! New rule applies to all players from 1st January! Clubs that have players still to come out are strongly requested to ensure that their players are informed about this training and encouraged to come out. Contact Emmet 07765934041 and 086029134 if further info required. Two new photo albums added recently for youth activities that have occurred over past few weeks. 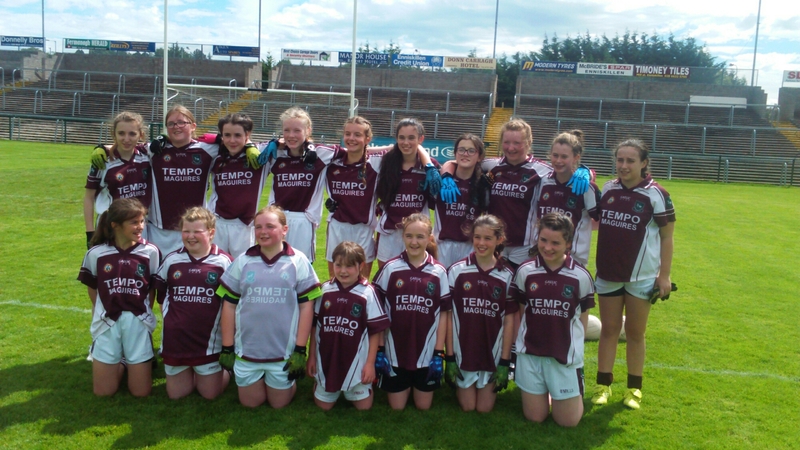 First up is Ladies U14 final where Tempo overcame Ederney, and 2nd album is from yesterdays visit to Croke Park for our Tempo Óg participants, who had a great day out. A 3rd outstanding photo album will be added soon for the Paul & Orla blitz which took place at end of June. You can access the albums by clicking on Gallery along the menu bar on the top of the Tempo Maguires page and scrolling to the new photo albums at the bottom of the list, or by following the links below. Tempo u14 girls played their 3rd game in a week, 4th in 9 days but kept the best to last as they won the league title, beating Ederney 4-8 to 3-7 in Brewster Park. Tempo were on top in the first half and had goals from player of the match Cadhla Bogue (2) and Ursula Fee, with a steady supply of points from Kayleigh West, Cadhla, and Cora McCaughey. One of these goals coming from great pressure exerted on Ederney defence by Laura Cassidy. Further back Sineve Cassidy, Megan Hamilton, Anna Marie Kennedy and Laoise McNally were working very hard to keep a strong Ederney attack at bay, while a feature of the game was Tempos abilty to win Leahs strong kickouts to either wing. Half time score 3-5 to 1-5. Tempo again started 2nd half strongly with Cora scoring a great goal. Mid way through the half Tempos character was tested when they lost the ever reliable Sineve Cassidy to injury. However, they answered this test with strong running from Ursula, Kayleigh, Cadhla and AnnaMarie and this resulted in further points from AnnaMarie and Molly Bogue, who had a great game and was regular outlet for Tempos defence. Ederney did manage 2 second half goals but Tempo done enough in the end to thoroughly deserve the trophy. Strong performances from any number of Tempos players as Cadhla was deservedly awarded player of the match and Ursula picked up the cup. U14 girls had to work extremely hard last night against visiting Belcoo to reach the division 3 final, Tempo winning by the narrowest of margins in a low scoring affair, 1-4 to 1-3. They now go on to play Ederney again in the league final this Saturday, match at 12:45 in Brewster Park. Please come out and support the girls who are reaching the end of a long season. Last nights game was their 2nd game within a couple of days, having played Ederney on Monday night, and this had a definite effect on the overall performance. Although getting off to a good start, a couple of early points from Leah Campbell and Ursula Fee helping to settle the team, the rest of the half was end to end play. Two further points from Cadhla Bogue and one in reply from Belcoo left scoreline 0-4 to 0-1 at half time. Belcoo piled on the pressure in the 2nd half, however they also found scores difficult to come by as Tempo defended strongly to deny them many clear opportunities. One particular piece of last ditch defending by Sineve Cassidy as she cleared the ball of the line denied Belcoo a clear goal. Belcoo did manage two points to leave just a single point between the teams with about 8 minutes left to play. Tempo eventually managed to lift the siege and apply some pressure of their own, and this resulted in a goal for Ursula Fee. However Belcoo replied almost immediately with a goal from midfielder Ciana McGrath. A draw may have been a deserved result with extra time on the cards, but there were no more scores over the remaining minutes as Tempo kept the ball down at the other side of the field and had a couple of late wides that would have eased the nerves. 2 days of rest now before their 3rd game of the week, this being the final at 12.45 on Saturday in Brewster Park. 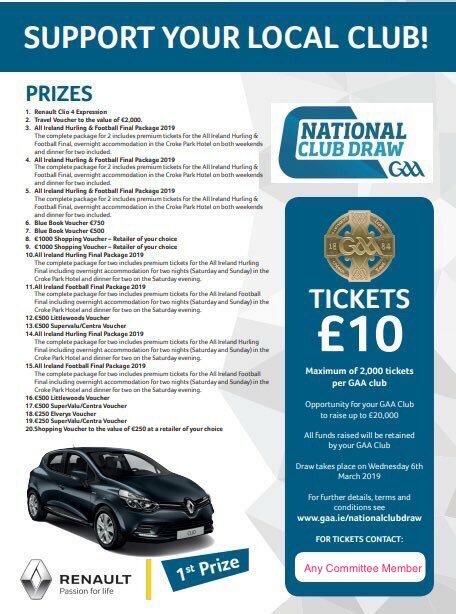 Players meeting at 11.30 in Tempo or 11:50 at Brewster Park. Please ensure you have Tempo socks and shorts for the final. Please note there is parade in Enniskillen on Saturday so give yourselves extra time to get to Brewster Park due to road closures and additional traffic. 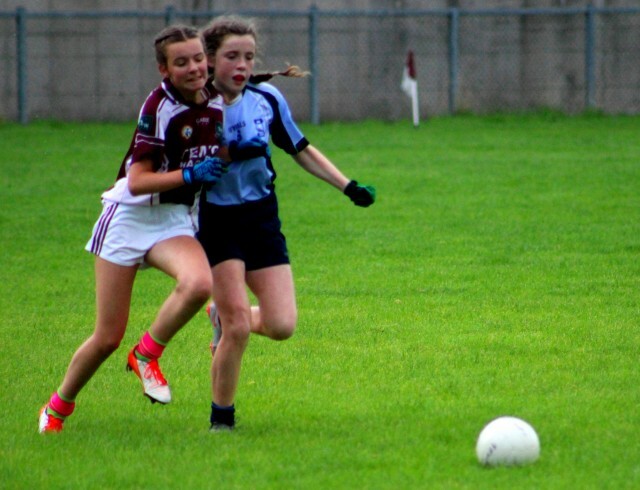 Kayleigh West working hard to win this loose ball against Niamh McAloon (pic courtesy of Belcoo GAA). Girls U14s still have it all to do to reach the league final following a narrow defeat last night to Ederney by 2 points. They get a 2nd chance when they play Belcoo, this match scheduled for 7pm in Tempo tomorrow. Meeting in Tempo tomorrow at 6.15pm. Tempo never got going properly in the first half against Ederney and left themselves with an uphill struggle in the 2nd half. However, a much improved display in the 2nd half saw them dominate possession and with goals from Cadhla Bogue, Kayleigh West, and Laura Cassidy, they eventually took the lead with a minute or two left. However, Ederney mounted one last attack that resulted in their 6th goal of the game, and they go into the final this weekend following a scoreline of Ederney 6-3, Tempo 3-10. 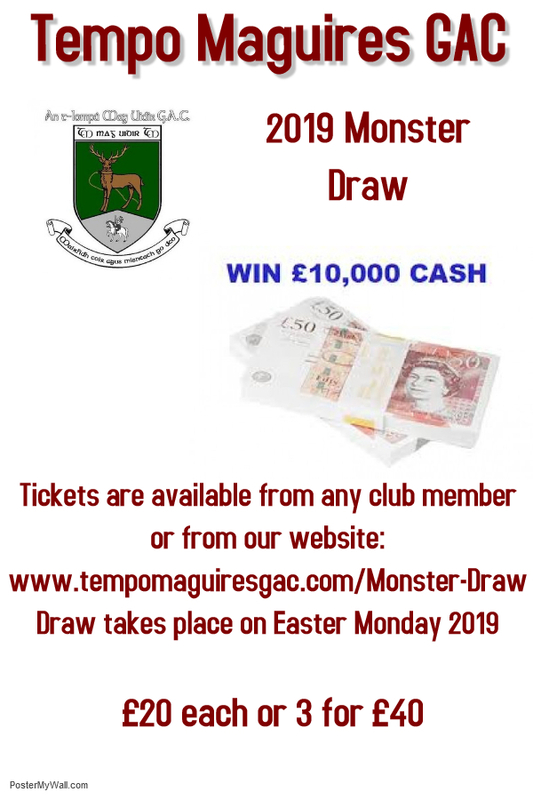 Tempo still have a chance to join them but need to play from the start in tomorrows encounter with Belcoo.